Portland is full of interesting stories hiding in every neighborhood, nook, and cranny. Every day I am amazed at what I discover and who I meet. These stories and the people behind them make Portland a vibrant city and great place to live. Read the inspiring stories from local people following their dreams in Portland and how they are enriching the communities where we live. These people prove to me every day that the community spirit is alive in Portland. 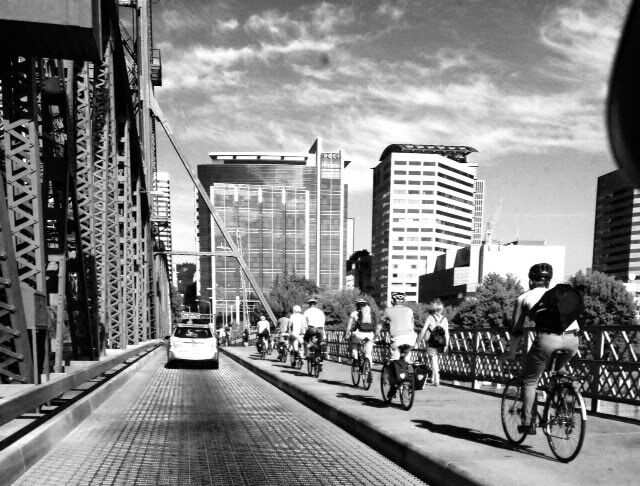 Portland is full of wonderful surprises, beautiful neighborhoods, and opportunities to explore by foot and by bike. If we take the time to explore our city more slowly, we really get to experience the wonderful place where we live. Many talented artists call Portland home, but their work is hard to find. I have collected some of their work to share with you. Get to know some of this work by exploring the Media Gallery. Story telling connects us with people and with ourselves. Good stories get our attention and resonate with us. When we share our own stories, we invite people to connect with us in a more personal way. These personal connections are the building blocks for creating strong relationships and community. Sharing your story is an effective way to grow your business. As you build your community and expand your reach, you will attract more interest in your work. Your work also begins to blossom, as you gain confidence from the support in your community. You create a space for rewarding work.